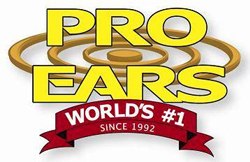 Pro Ears by Altus Brands offers the ultimate in hearing protective electronic and passive ear muffs, including some of the highest rated ear muffs made anywhere in the world today. With Pro Ears you can choose from models made specifically for industry, sport shooting, military and police work, as well as general noise protection. The Pro Ears line of ear muffs for industry includes models that offer some of the highest noise reduction available in any ear industrial ear muff. The general noise protection ear muffs from Pro Ears include passive ear muffs that are ideal for every member of the family from adults down to babies under 1 year old! And the Pro Ears sport models are world class in features and options, with a wide range of color choices to meet most any preferences you may have. With Pro Ears, you can be confident you have the best hearing protective ear muffs money can buy. (NRR 28) Pro Ears Stealth 28 Electronic Hearing Protectors provide hearing protection plus up to 5x amplification of safe sounds, in a sleek and low-profile banded design that won't get in the way of hats and helmets. Ultra lightweight. Ideal for hunters and shooters. Add one of these conversion kits to use your headband model Pro Ears, Pro Tekt, or Pro Tac with a hard hat, cap or welding helmet. Conversion is not permanent, so you can switch back to headband if you wish. Heavy cloth bag with no padding and w/Pro-Ears Logo. Great for keeping the dirt off your ear muffs between uses. Pro Ears Ear Muff Belt Clip is the economical way to keep your ear muffs close at hand but not in the way. The sturdy plastic clip snaps securely around your belt so the clip cannot fall off while you work. The universal hook profile fits nearly any headband or neckband ear muff. Make your Pro Ears, Pro Tekt, and Pro Tac Electronic or Passive Ear Muffs like new again with these replacement kits. Replacement is recommended every 9-15 months for best performance. (NRR 30) MRI Safe. The Pro-Form Leather ear seals and generously padded headband make Pro-Ears Ultra Pro ear muffs comfortable to wear for extended periods. These cost more than most other ear muffs, but once you put them on, you will know why. (NRR 25) MRI Safe. At NRR 25, ReVO is one of the highest rated ear muffs made to fit children available at any price. ReVO offers superior craftsmanship, thick padding at all contact points, and smaller ear cups designed especially for children. (NRR 26) MRI Safe. These ear muffs deliver NRR 26 protection from noise, which is an excellent balance between solid hearing protection and the ability to still hear important warning sounds around you. An excellent choice for teens, smaller adults and women who may find other ear muffs to be too heavy or bulky to be comfortable. This is a replacement cable for ProEars Electronic Ear Muffs from Altus Brands. This cable is already included with all new ProEars Electronic Ear Muffs. This is a replacement cable for use if your original cable becomes worn out or lost. (NRR 25) ReVO are the revolutionary new premium ear muffs made specifically for very young children. One of the highest rated child sized noise protection ear muffs available anywhere. (NRR 26) As the name suggests, the Pro Ears Ultra Sleek is designed to be low-profile. The Ultra Sleek features Pro Ears' thinnest and most lightweight ear cups, leaving the wearer with plenty of mobility and freedom. WoodLand Whisper In The Canal Style Hearing Enhancers are a simple and inexpensive solution that greatly increases your ability to hear. Includes two devices so you can readily tell from which direction sound is coming.